The largely ruinous medieval castle at Tutbury in Staffordshire is owned by the Duchy of Lancaster and boasts an extraordinary history. The site is said to have been the residence of the Saxon kings of Mercia, and is named in honour of the Nordic god Thor or Thoth, god of Thunder, who was once worshipped at this spot. Tutbury Castle has been described as 'more of a fortified town than a castle', it stands dramatically on a wooded slope overlooking the River Dove, dominating the town of Tutbury and boasts spectacular views of the surrounding countryside and the scenic Peak District hills. The castle was founded in 1086 as one of the many castles erected to stamp the authority of the Norman conquerors over Saxon England, but folowing a siege the castle was dismantled in 1175-6. Only the chapel now remains from the twelfth century buildings, the rest of the castle we see today dates mainly from the fourteenth and fifteenth centuries when the castle was rebuilt. Only the outer part remains of what used to consist of the south tower with a winding staircase and two chambers and the high tower. 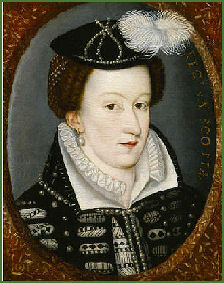 The ill fated Mary, Queen of Scots was imprisoned in the castle in the south tower in the sixteenth century by her cousin Elizabeth I.
Tutbury was once the headquarters of Henry de Ferrers (died circa 1093), a powerful Norman magnate and 1st Earl of Ferrers and Lord of Longueville in Normandy. De Ferrers was a major landowner who is believed to have fought at the Battle of Hastings for which he was rewarded by being granted extensive lands in Derbyshire and Leicestershire by William the Conqueror. Tutbury formed part of the Wapentake of Appletree, which covered a large part of southern Derbyshire. Along with his wife Bertha, de Ferrers endowed Tutbury Priory, a Benedictine establishment, with two manors in about 1080. Robert III de Ferrers, 6th Earl of Derby, inherited the de Ferrers estates in 1254, the estate was crippled by charges arising from his fathers death. He joined in the 1263 de Montfort rebellion against King Henry III which was known as the Second Barons War, attacked Worcester and carried away the bonds recording his loans, which effectively ameliorated his debt problem. He then joined with de Montfort's forces at Gloucester Castle, recently taken by Henry III's son, Edward, whom he was known to loathe. The origins of this ill feeling may well have been in the Ferrers family's long held claims on the estate of Peverel Castle which they claimed through the marriage of Margaret Peverel to Robert de Ferrers, second Earl of Derby. King John had assigned stewardship of the estate to the fourth earl, Robert's grandfather, but Henry III had taken it back and gave it to Prince Edward in 1222. 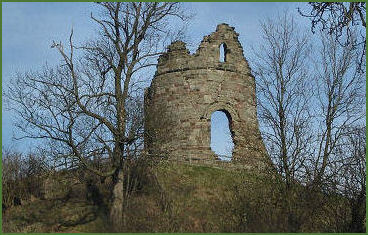 Edward attacked de Ferrers at Chartley Castle, and in 1264 destroyed Tutbury Castle. In 1269, Robert was captured, attainted of high treason, and imprisoned in Windsor Castle, his estates, including Tutbury Castle were granted to Edmund Crouchback, Earl of Lancaster, the second son of Henry III and have remained part of the Duchy of Lancaster ever since then. The main gateway was constructed by Edmund's son, Thomas, Earl of Lancaster in 1313-4 who made Tutbury his principal residence. Thomas was one of the leaders of a rebellion against King Edward II, Edward marched towards Tutbury from Coventry, Thomas hoped to stop him at Burton Bridge and having arrived there first, fortified it and held the King's army at bay. The bridge was the only crossing point over the River Trent in the area, but, unknown to Thomas, Edward was informed about about a little known ford at Walton where the bailey bridge now is. On 10th March 1322, the King, leaving a decoy force at the bridge, took the main body of his army up river, and attacked Thomas' right flank by surprise. Thomas was utterly defeated and retreated to Tutbury Castle, where he expected to find reinforcements of Scottish and Welsh mercenaries, promised by Edwards enemy, the Scottish king Robert the Bruce, but they never turned up and he was forced to flee. On arriving at Tutbury the King had the castle demolished . Thomas of Lancaster was executed at Pontefract 1321 for his part in the revolt, but his younger brother Henry was subsequently allowed to succeed to his estates. The British Museum holds a hoard of coins dating from the period, known as the Tutbury Hoard, it is the largest hoard ever discovered in Britain, with estimates varying from 100,000 to 300,000 coins, it was found in the Bed of the River Dove in June 1831. It includes coinage from England, Ireland, Scotland and from mainland Europe, dating from the thirteenth and fourteenth centuries including coins from the reigns of Henry III, Edward I, and Edward II of England and Alexander III of Scotland. 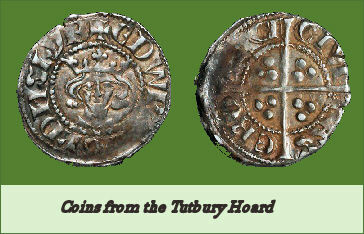 The hoard was hidden in the bank of the River Dove shortly after Thomas' defeat at the nearby Battle of Burton Bridge in 1322 and may well have belonged to him. The estates passed to Henry's son, Henry of Grosmont (1300-1361/2), his daughter and heiress, Blanche of Lancaster married John of Gaunt (1340-1399), the third surviving son of Edward III who later became Duke of Lancaster. Tutbury Castle had lay derelict since 1322, Gaunt rebuilt the castle and made it his principal residence. A new curtain wall, towers and residential buildings were added over the next hundred years. On the death of Blanche of Lancaster he married Constance of Castille. She laid out the gardens at Tutbury, a field nearby known as the 'Queen's Garden' is named after her. When John of Gaunt died in 1399, his eldest son Henry of Bolingbroke' inherited the estate. He deposed his cousin Richard ll to become King Henry lV, the first monarch of the House of Lancaster and so the castle became crown property. It has been visited by many English kings, including Henry VII. On 2nd May, 1568, Mary, Queen of Scots escaped from Lochleven Castle were she had been imprisoned by the Scottish lords and fled to England to gain aid from her cousin Elizabeth I to recover her throne. "The daughter of debate" as Elizabeth I was known to refer to her, had, by her actions placed the English Queen in a dilemma. Her strong political sense urged that she should support the Protestant Scottish lords, but she also felt a sense of outrage that a fellow sovereign should be treated in such a manner. To keep Mary in England was to incur risks of her being the focus of Catholic plots, to return her to Scotland might be sending her to her death, but to send her abroad could mean her bringing a foreign power into Scotland. Elizabeth characteristically opted for what she considered to be the safest option and imprisoned her Scottish cousin in England. Mary hated Tutbury, describing it as it as “sitting squarely on top of a mountain in the middle of a plain”. She complained often of the damp and wet plaster and wrote of its miseries in winter when the “mechante vieille charpenterie” caused the wind to whistle through her chamber. Shortly after arriving, Mary’s keeping was handed over to George Talbot, Earl of Shrewsbury, Constable of Tutbury Castle. Shrewsbury remained her gaoler with only a few respites for the next fourteen years. Mary's life began its depressing and monotonous decline, and her health began to deteriorate due to inactivity and confinement. Although she loved the outdoors and physical activity she was restricted to embroidery, playing cards and reading. She worked on many of her embroideries at Tutbury along with the formidable Bess of Hardwick, the wife of the Earl of Shrewsbury, whom she befriended. At the end of February 1569, Nicholas White, who was travelling to Ireland on behalf of William Cecil, called at Tutbury to visit the Queen of Scots. His letter to William Cecil reports “All the day she wrought with her needle and that the diversity of colours made the time less tedious”, he also recorded that Mary “hath withal an alluring grace, a pretty Scotch accent, and a searching wit clouded with mildness. Fame might move some to relieve her, and glory join with gain might stir others to adventure more for her sake”. Mary was moved to Wingfield Manor in April of 1569, but was returned to Tutbury in September with an increased guard and a much reduced household. In November 1569, due to alarm caused by the Catholic Rising in the North of England, she was moved hurriedly to Coventry. After the rebels were defeated, she was again sent to Chatsworth House in May 1570. In January of 1585 she was moved again to Tutbury and was this time guarded by Sir Ralph Sadler, Chancellor of the Duchy of Lancaster. He was kind to Mary, finding his task as distasteful. This news caused consternation at the court of Elizabeth in April 1585 he was replaced by the puritan Sir Amyas Paulet, who Mary came to actively dislike. One of his first actions was to remove her chair and royal cloth of estate. Despite her tears, he remained unmoved and also curtailed her popular charitable activities in the town. Mary had been previously allowed to walk in the privy garden within the Castle walls, but under Paulet, she was held in the strictest confinement and was npt permitted to walk outside “for that heretofore under colour of giving alms and other extraordinary courses used by her, she has won the hearts of the people that habit about these places, where she has heretofore lain”. On Christmas Eve 1585, she was moved for the last time to Chartley Hall. After the discovery of proof that she was plotting against Elizabeth's life, she was sent to Fotheringhay Castle in Northamptonshire where she was beheaded in 1586. 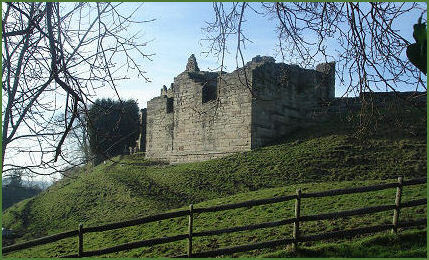 Mary Queen of Scots son, James I and King Charles I both used the Tutbury Castle as a hunting lodge. At the outset of the Civil War the castles defences were strengthened, Prince Rupert of the Rhine, the king's nephew, stayed at the castle in 1645 after the Battle of Naseby. It was one of the last places in England to hold out for King Charles I and withstood repeated onslaughts from the parliamentary troops between 1643 and 1646 but was finally captured by Parliamentary forces under the command of Sir William Brereton after a siege in 1646. Part of the Surrender agreement was that the castle be destroyed and it was accordingly slighted leaving the ruins we see today. The British Museum and the University of Birmingham conducted a research project in 2002 aimed at discovering more about the history of the castle. Excavations have unearthed Stone Age finds. The castle is now closed to the general public but weddings, historical speakers and re-enactors, events, craft fairs and ghost hunts are available. The castle is situated on the A50 between Uttoxeter and Burton.